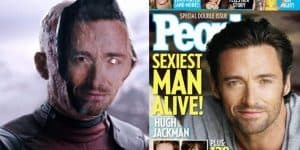 Deadpool 2 Scriptwriters Like The Idea Of Hugh Jackman Cameo | Nerd Much? In the same interview with The Hollywood Reporter in which scriptwriters Rhett Reese and Paul Wernick mention the Zombieland sequel, a Hugh Jackman cameo is suggested for Deadpool 2. And the pair seem to really love the idea. Since Hugh Jackman is officially retiring from his role as Wolverine after Logan, it seems only logical that he cameo as himself. And as Reese and Wernick say, it would be positively hilarious. With a reaction like that, I think we can hope to expect Hugh Jackman to appear in Deadpool 2, as it would fit the movie perfectly, regardless of the plot. It would be even better if Deadpool took a few shots at Logan, or any of the previous Wolverine movies, as Deadpool would be wont to do. Would you like to see Hugh Jackman in Deadpool 2? How do you think Deadpool would meet the famous actor? Let us know in the comments below!